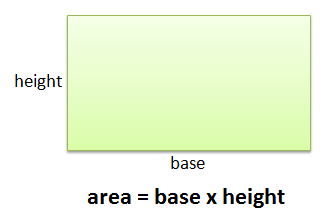 The area of a rectangle is the product of its base and its height. We will use this fact to derive the area of a triangle. If we can show that the area of the rectangle and the area of a triangle are related, then we can find the formula. To show the relationship between the two figures, we need to show that for any triangle, we can always create a rectangle using one of its side as the triangle’s base. We have four cases: acute, right, obtuse and equiangular triangles. For the acute triangle, we can construct a rectangle using one of its sides as base. Then we draw segment parallel to that base and passing through the vertex on the opposite side as shown in the next figure. We are sure that this is possible because given a line (the line containing the base) and a point (the vertex), we can draw a line parallel to the base and passing through the vertex. Notice that if we draw the height of the triangle, this divides the rectangle into two smaller rectangles. The triangle is also divided into two smaller right triangles. Since the diagonal divides the rectangle into two, the area of each right triangle is one half the area of rectangle containing them. Therefore, the area of the original figure is half the area of the large rectangle containing it (Can you see why?). Since the area of the rectangle is , the area of the triangle is . Let us try the two more types of triangles, the right and the obtuse. 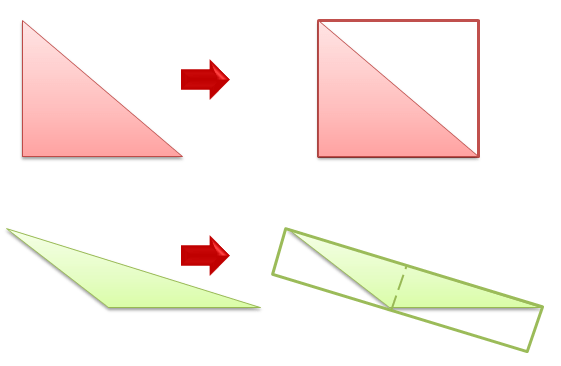 As we can see, we can also contain them in a rectangle such that at least one of the sides of the triangle coincides with a side of a rectangle. In the case of right triangles, it’s not only one but two! Justify why the method above will work (or not) on equiangular triangles. We only classified the triangles above in terms of angles. If we classify them in terms of the side lengths, will the method work?